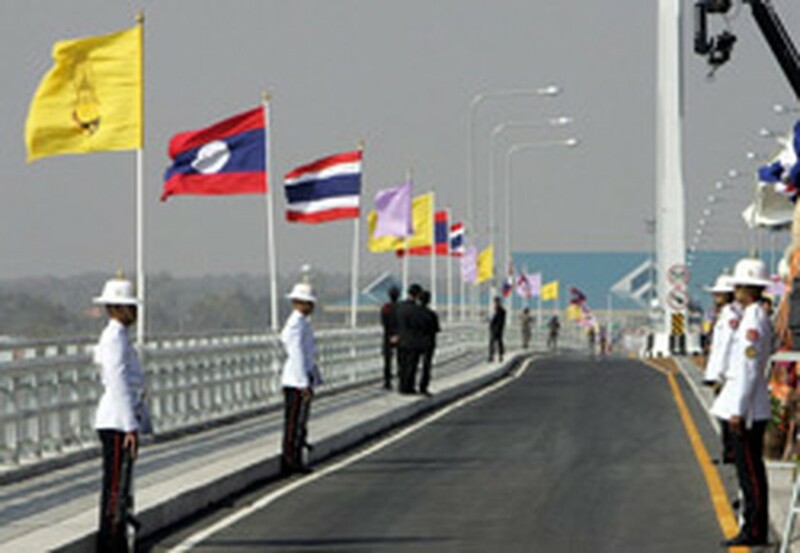 Thai security personnel stand next to Thai, Laos national flags during the opening ceremony of the second friendship bridge over the Mekong river at the Thai-Laos border, Dec. 20, 2006. Thailand and Laos celebrated the opening Wednesday of the second friendship bridge linking the two countries over the Mekong river, which both countries hope will boost trade and tourism. More than 10,000 Thais waved national flags and yellow banners, symbols of the country's monarchy, to herald the official unveiling of the mile-long (1,600-metre), 70-million-dollar bridge, which took four years to build. Prime Ministers Surayud Chulanont of Thailand, Bouasone Bouphavanh of Laos and Nguyen Tan Dung of Viet Nam attended the opening ceremony, presided over by Thai Princess Maha Chakri Sirindhorn. "This bridge is of particular importance to a landlocked country like Lao PDR, so it can boost potential for transport services and expansion of trade and tourism activities with its neighbours," Bouasone said. Surayud said the link would "foster economic development, trade and investment in the region." Katsuhito Asano, Japan's senior vice minister for foreign affairs, also joined the celebrations. The bridge was partly funded by a loan from Japan's international cooperation bank. The 12-metre-wide bridge -- which took four years to build -- links Thailand's Mukdahan province, located about 645 kilometers (400 miles) from Bangkok, and Savannakhet province in southern Laos. The first friendship bridge linking Thailand with landlocked Laos, which opened in 1994, spans the Mekong between Thailand's northeastern Nong Khai province and the Laotian capital Vientiane.